Last Christmas, my husband’s family all gathered in California to spend a week together. It was that week of bizarre weather when it drizzled almost nonstop…and every native Californian freaked out and half the roads closed (as a Virginian, I found this reaction about as silly as how Richmonders behave if there’s a possibility of snow…but apparently there were actual mudslides, so maybe the Californians had a reason to be worried). But while we were there, we played dozens of board and card games, hiked up to the Hollywood sign in fog so thick we were literally about 20 yards away from it and couldn’t see any of the letters, and did yoga in the sitting room. And, lo and behold, I was not the only vegetarian present! Clara, my husband’s cousin, is a great cook, and one evening she made this fantastic butternut squash soup. 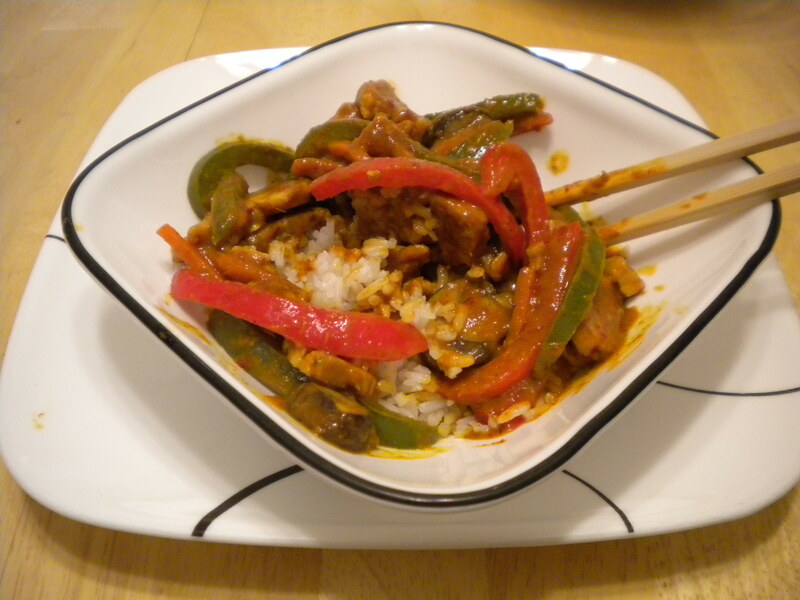 It’s vegan-friendly, spicy, and absolutely delicious! 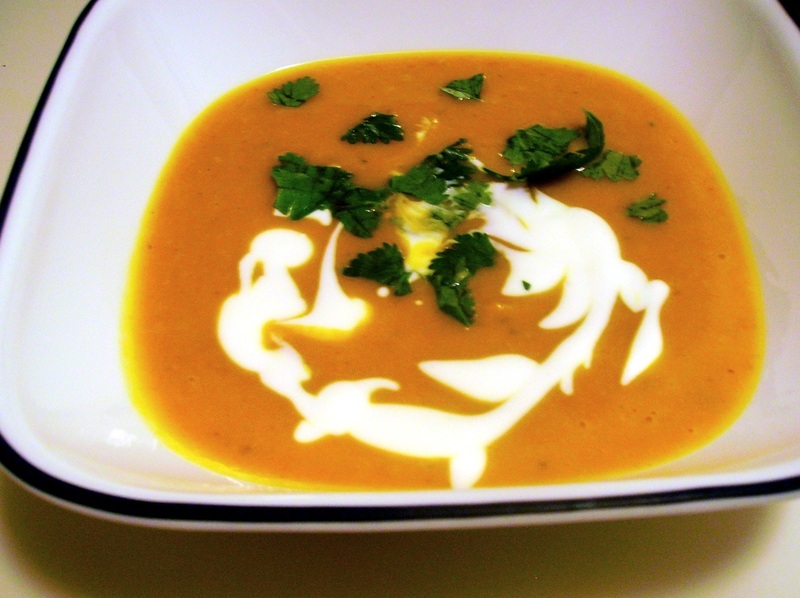 I have been dreaming of this soup since last year, looking forward to fall/winter squash season so I could make it and share it with you all. Now it’s perfect soup weather, and this filling bowlful will warm your stomach and your taste buds. It takes about 3½ hours to make from start to finish, and while a lot of that time is inactive, this might be a good dish to prepare ahead if you are having guests, or to save for the weekend. Let’s dig in! So. Thanksgiving is over. Leftovers abound. You should make a childhood favorite cookie of mine, called t’dootskies /th dʊt skiz/. You may know them by a different name. 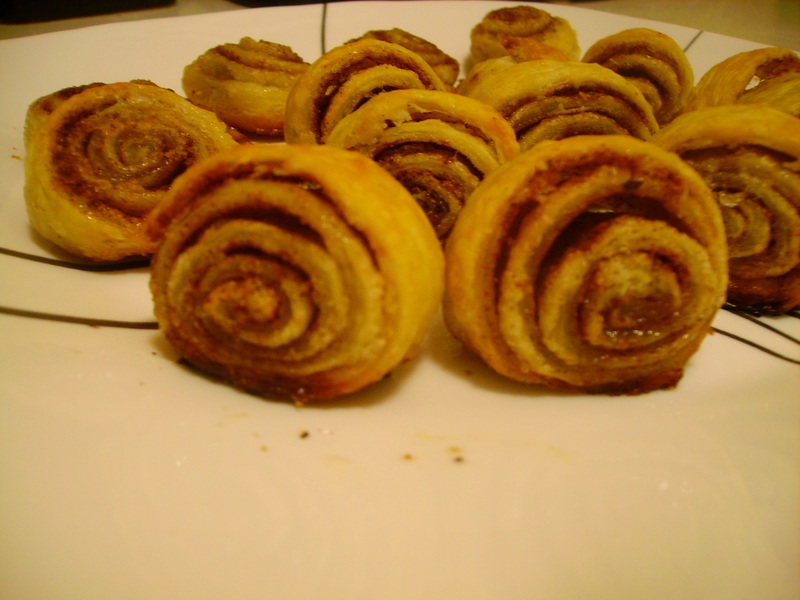 All I know is that, like magic, on the days that my mom would make pie, these little spiral cookies would also appear on a plate on the counter, and my brother and my dad and I would all take turns sneaking into the kitchen and stealing another one when my mom wasn’t looking (sorry Momma!). My family was never really big on appetizers. But that’s probably because my mom is super punctual. When she says, “Dinner will be around 2:00,” you can be pretty sure we will be eating no later than 2:30. Amazing. I, on the other hand, notoriously underestimate how long a meal will take to prepare. I once invited some friends over for a fancy “French” dinner and they had to help me prepare the whole thing because when they showed up—on time—I had only just started making the beurre blanc and the fish was still in the fridge. 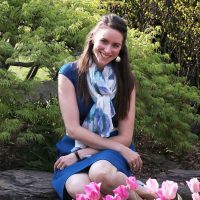 Thankfully, my darling husband had cut up some cheese and crusty bread, so they didn’t have to starve while they helped me cook (Kimberly and Paul, I am still thankful for your flexibility and kitchen skills!). So if you are anything like me, you may want to plan a few appetizers to help tide your family over until the big Thanksgiving dinner is ready. 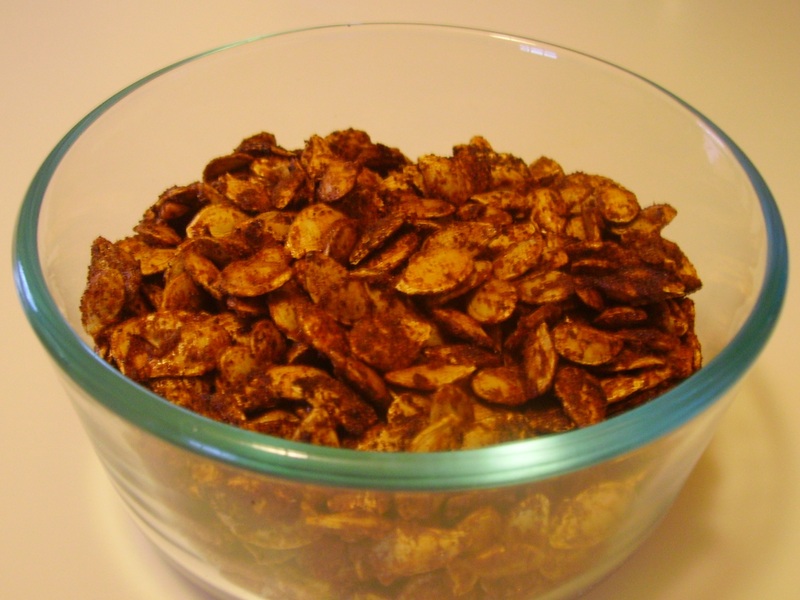 Even if you hadn’t had appetizers on the agenda, I have a great munchie for you that takes about 20 minutes to prepare: roasted squash seeds. Have you ever heard the phrase “as easy as pie”? Because it exists for a reason: pie is incredibly simple. It’s easier than cookies. I mean, you practically can’t go wrong. I’m serious. The only catch is…you are absolutely not allowed to buy a pre-made crust. Don’t do it! Again, I promise it’s not as scary as you think it will be. 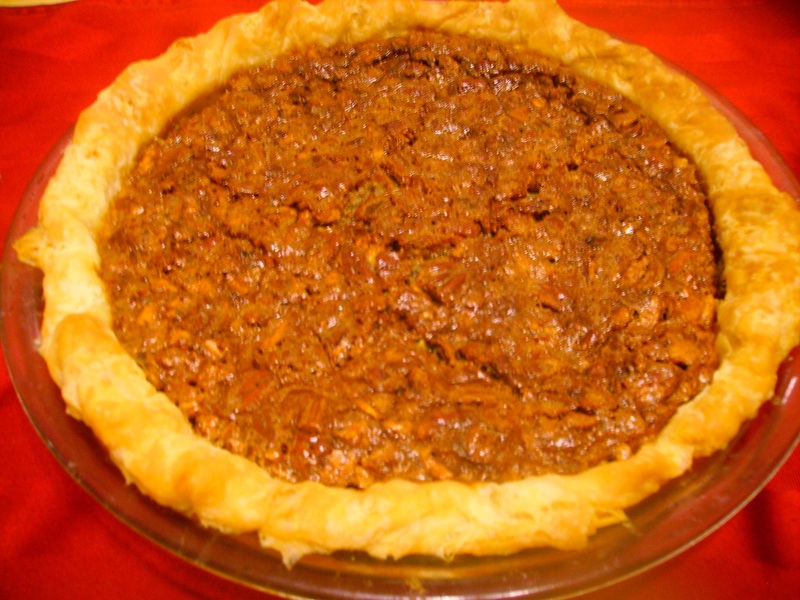 It, too, is as easy as pie [crust]. So, I think you should jump on this pie wagon and enjoy some pie with me! Holy moly, it’s almost Thanksgiving! Let’s talk side dishes. As a vegetarian, I obviously skip the turkey and the giblet gravy, so my Thanksgiving plate is entirely dependent on the abundance of meat-free sides at the table (which is fine with me…more room for pie!). But I have to admit that Thanksgiving has never been high on my list of holidays that excite me, because I’m not a huge fan of most of the traditional dishes. If I never eat a candied yam, I will be a happy camper. Green bean casserole? No thank you. And you can forget about cranberries (for obvious fruit-hating reasons). 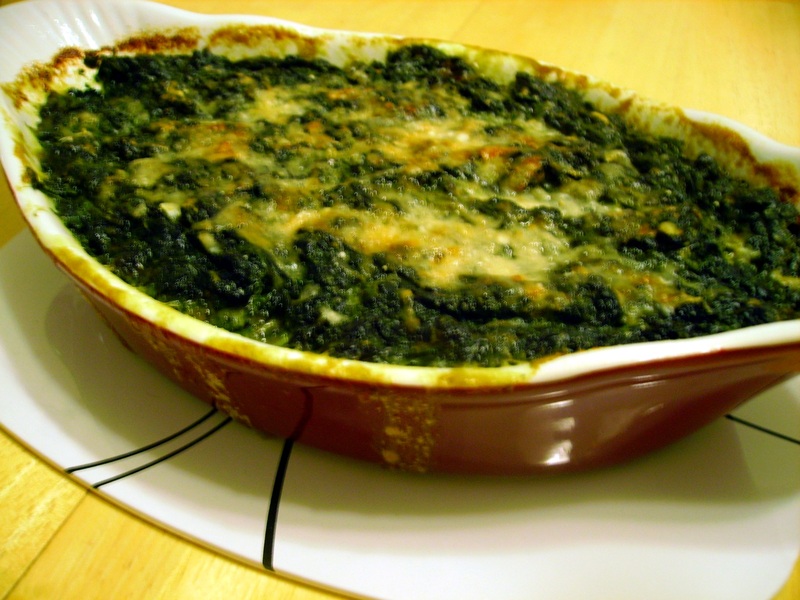 But instead of subsisting entirely on rolls and mashed potatoes, let’s bake up some cheesy, creamy spinach. Capital YUM. And don’t worry…it’s not any healthier for you than the mountain of buttery carbs sitting next to it. But hey, at least it is green! I know the traditional pumpkin dessert is pie, but honestly I have never really gotten behind pumpkin pie. It’s just something about the cloves…and the oddly moist, yet gelatinous consistency of the pumpkin filling. So what is a pumpkin lover to do? I found this recipe a few years ago and have been dying to make it ever since. But, you know how it goes…the list of desserts to try is so long, and before you know it, Fall has come and gone twice and you still haven’t served up a slice of pumpkin cake! Fortunately, this past Halloween my in-laws had a pumpkin carving party. Just the thing I had hoped to supplement with some un-pie pumpkin goodness. Yes, this cake requires about 27 bowls and pans, and contains two different kinds of cooked frosting. 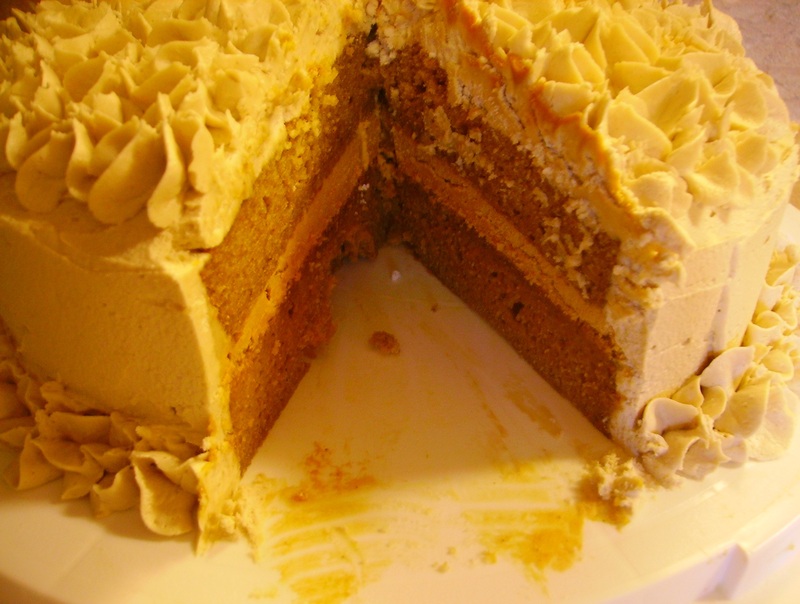 But if you are looking ahead to Thanksgiving and thinking that you just can’t get excited about pumpkin pie…or you want to impress your in-laws by doing pumpkin two ways (how fashionably haute cuisine of you…), then collect every last wooden spoon in your kitchen and make this cake with me! Between you and me, I got rave reviews for this cake from a family of folks who aren’t particularly interested in dessert…so what are you waiting for!? So, question. What makes a pizza a pizza? Seriously…write me and let me know what you think. Give me examples. Convince me. I think this dish could only be called a pizza if you subscribe to the toppings-on-a-crust definition of pizza, but either way, it is delicious! 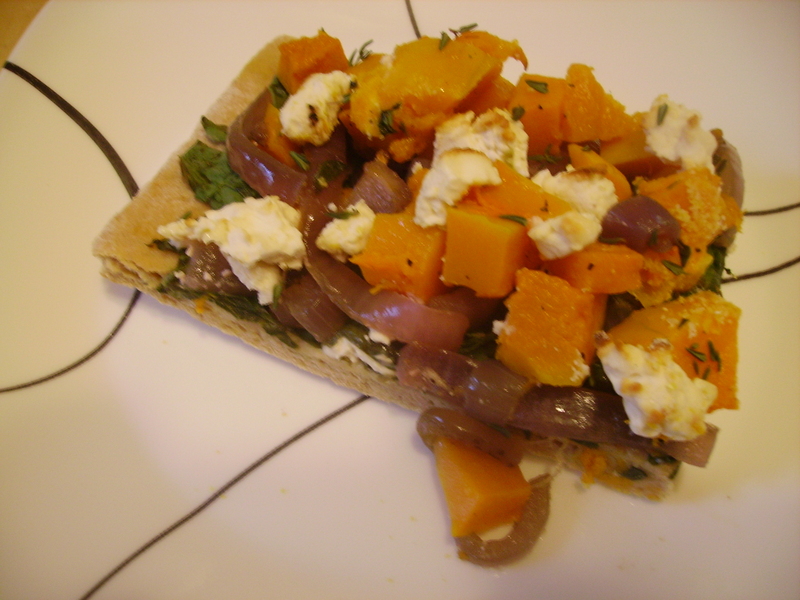 This flatbread “pizza” will satisfy vegetarians and non-vegetarians alike: it’s hearty, low-fat, colorful, and full of wonderful fall squash, mmm! One of my favorite movies of all time is the Meg Ryan/Tom Hanks version of You’ve Got Mail. I haven’t watched it in ages, partly because I only own it on VHS (!!). But when I look outside at the beautiful golden and red leaves (which are now carpeting our lawn), I almost always find myself thinking about children’s bookstores, scotch tape, and bouquets of sharpened pencils. I’ve only been to New York once (and it was about a thousand degrees outside…definitely not Fall), but when I think about an iconic New York food, I don’t think pizza or hot dogs or even bagels. I think black and white cookies. Go into any deli on any street corner and you will find a dozen of these gigantic cookies sitting at the cash register, looking perfect and wrapped in plastic wrap. Unfortunately, I learned the hard way that black and white cookies can fall anywhere on a spectrum from moist and sweet with slightly crunchy frosting, to dry and flavorless through and through. 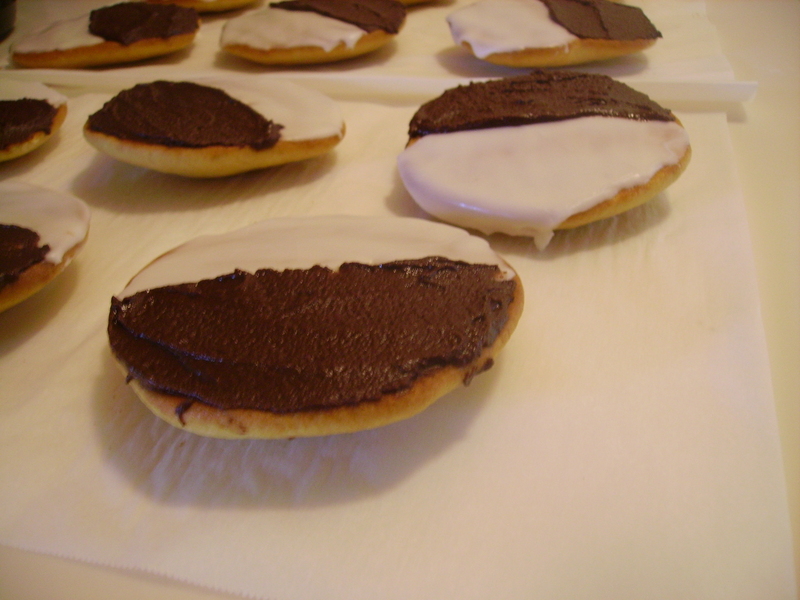 In honor of New York in the Fall, let’s make black and white cookies together!